Figure 6 is a screen image of the Windows Geiger counter radiation program. This program is free and is available for download at the bottom of the page here. Figure 6. Screen Image of PC Radiation Monitor Windows Program. You may download the NEW 2014 WINXPV2 or the original WINXP version of the program. The program gathers information it receives on one of its COM ports and displays the information on the PC screen. The information graphed is the Counts Per Second (CPS) from the geiger counter. The CPS scale is shown on the left side and equivalent radiation level in mR/hr is shown on the right side. The program automatically scales depending upon the CPS read. The graph continuously scrolls to the right with updated information. The graphs created with this program may be saved in disk and loaded for review later. The amount of data that may be saved is limited by the memory in your system, or space available on your hard drive. But it is safe to say you could continue to graph for weeks. The PC interface performs two functions. First it counts the TTL digital pulses from the Geiger counter in one-second intervals, and then sends that information out in a standard 9600 Baud RS-232 format. The schematic for the interface is shown in Figure 7. 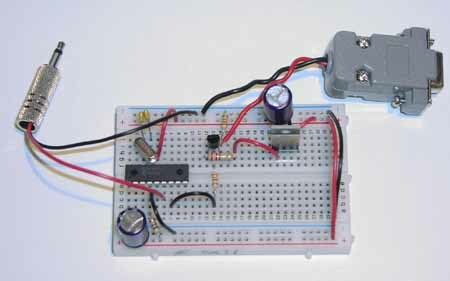 A 9V transistor battery powers the PC interface. The Voltage is regulated down to 5 volts for the PIC microcontroller. Notice however that the full 9 volts from the battery is provided to the top of R2. This section makes up the RS-232 connection to the PC. The +9V from the circuit is close enough to the expected +12V of the RS-232 connection on the PC to make a reliable serial connection. The female DB-9 connector on the interface incorporates a NULL modem to facilitate communication with the PC. Figure 7. Schematic of PC Interface. Circuit prototype is shown in Figure 8. Figure 8. Picture of proto-typed PC Interface.